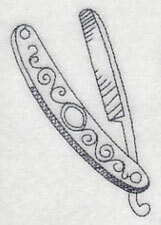 The Victorian era is known for its classic elegance and timeless style. 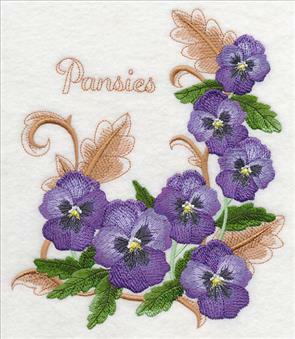 From pretty parasols to delicate flowers, these designs create a graceful look for any project. 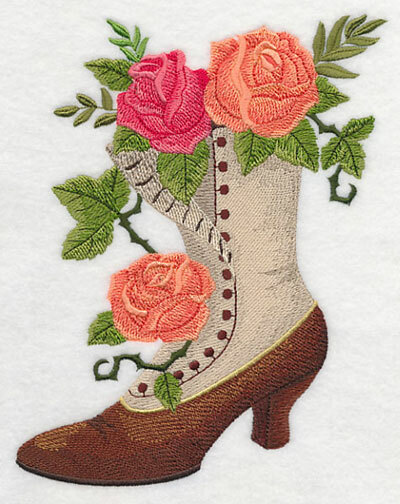 Pillows and wall hangings flourish with Victorian boots, butterflies, and fans. 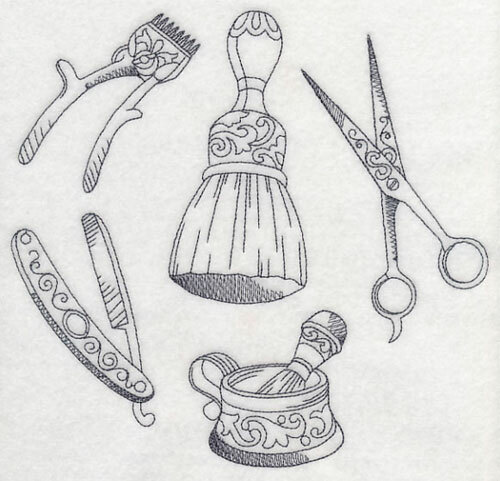 Adorn toiletry bags with collages straight from the barbershop or vanity, or update a handkerchief or bed linens with light-stitching designs. 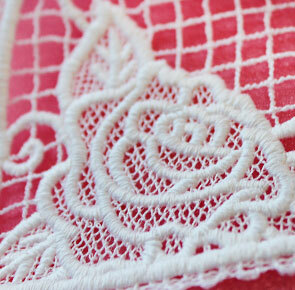 Plus adorable animals, Battenburg lace hearts, and more! 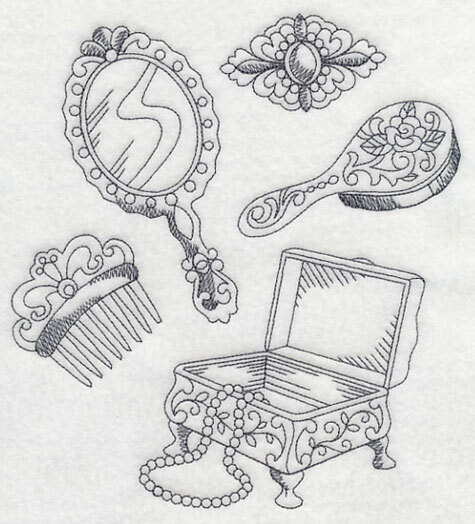 Order these Victoriana designs today! 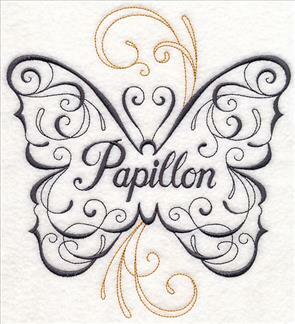 Add luxury to your projects with stunning antique-inspired embroidery designs. Blooming flowers and winding vines add an extra level of beauty to classic Victorian elements. 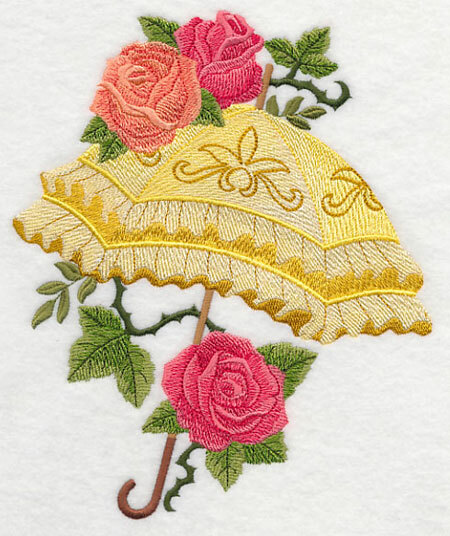 This open parasol makes a stunning addition to pillows, tote bags, quilts, and more. 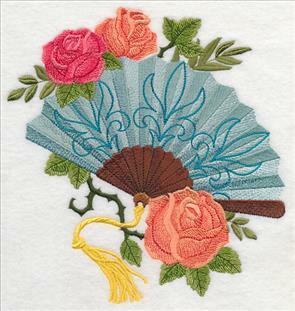 6.47" x 7.80" and 5.85" x 7.06" and 4.85" x 5.85"
In addition to the gorgeous design above, a Victorian fan and butterfly are also available, and are elegant additions to a wide variety of embroidery projects. 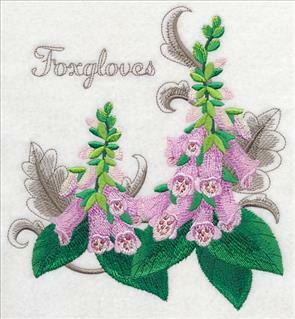 Terrific for adding to a framed piece, or a wall hanging! 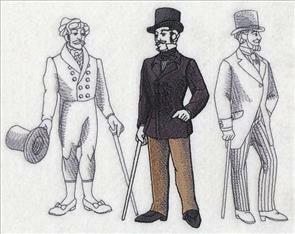 7.50" x 7.80" and 6.90" x 7.18"
7.19" x 7.80" and 6.50" x 7.05"
5.86" x 6.35" and 4.86" x 5.27"
These Victorian designs were inspired by Jane Austen, and are perfect for celebrating the elegance and style found in her literary works. 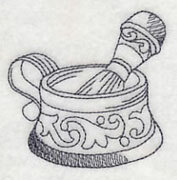 Add one to your next project! 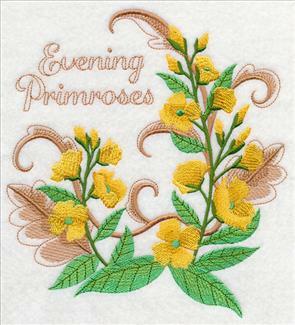 6.66" x 7.80" and 5.85" x 6.87" and 4.86" x 5.70"
Gorgeous flowers of all colors and shapes get a sophisticated edge thanks to light-stitching baroque detail. 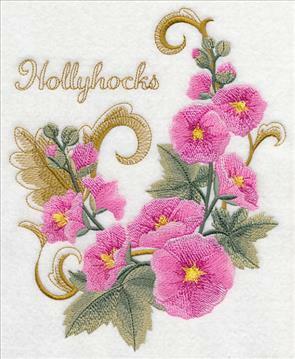 Whether you're a fan of hollyhocks, poppies, or roses, you'll swoon for these floral motifs. 6.88" x 8.45" and 6.05" x 7.43"
6.73" x 7.79" and 6.30" x 7.29"
5.85" x 6.75" and 4.81" x 5.57"
Add these delightful flower designs to your home decor projects! 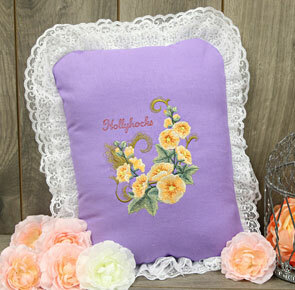 A pretty Victorian pillow with lace is the perfect place for the blooming motifs to shine. Make this sophisticated pillow by following the step-by-step instructions in this project tutorial. 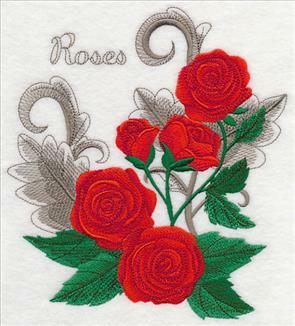 The text included on each of these designs is featured on the last color stop, making it easy to embroider the flowers on their own. 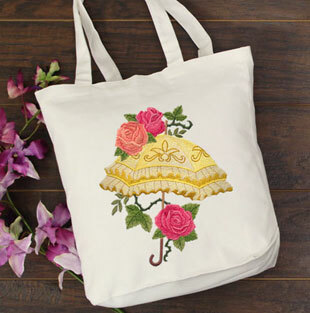 Terrific for tea towels, tote bags, and more! 6.90" x 7.67" and 6.49" x 7.23"
7.15" x 7.79" and 6.43" x 7.00"
Pick your favorite flower to use on gardening gear or projects for your home. Or, stitch them all on a quilt, wall hangings, or series of framed artwork! 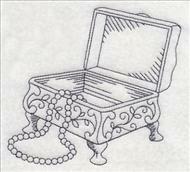 6.88" x 8.15" and 6.10" x 7.22"
7.14" x 7.80" and 6.69" x 7.31"
5.85" x 6.39" and 4.81" x 5.26"
Get these beautiful baroque-accented flowers using the links above, or get them all in a design pack. 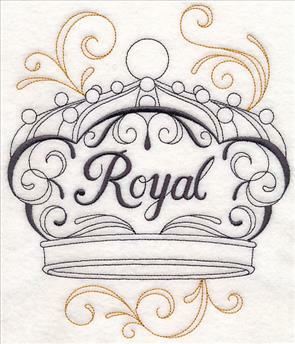 Light, quick-stitching words and phrases such as "Royal," "Amour," and "Papillion" are fast additions to embroidery projects. 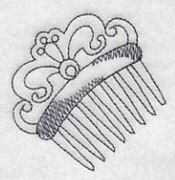 Add your favorite to a T-shirt, tote bag, or tea towel. 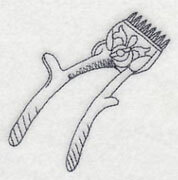 6.66" x 7.80" and 5.89" x 6.90"
6.89" x 7.80" and 5.90" x 6.68"
4.86" x 5.50" and 3.42" x 3.85"
The intricate flourishes and chic style of these designs make them a tasteful addition to home decor projects as well. Pillows, wall hangings, bedroom decor, and more all get an elegant update with these designs. 6.89" x 7.52" and 5.86" x 6.39" and 4.86" x 5.30" and 3.53" x 3.85"
Fabric jewelry cases, makeup bags, travel gear, and more will get a stylish makeover when adorned with this fabulous collage. 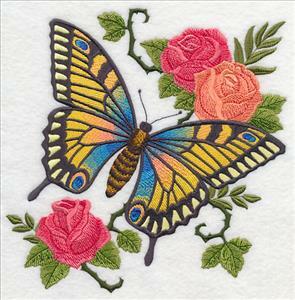 The light stitches and open areas of this design make it particularly nice on low-nap fabrics, including denim, twill, canvas, and more. 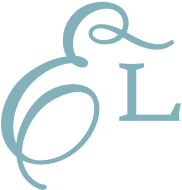 7.19" x 7.80" and 6.53" x 7.09" and 5.53" x 6.00" and 4.61" x 5.00"
Stitch the coordinating separations from the collage above on bathroom decor, use with the male version below on his and her projects, or on their own to accent a towel or handkerchief. 3.57" x 2.11" and 2.29" x 1.35"
2.38" x 2.42" and 1.52" x 1.54"
7.80" x 7.43" and 7.10" x 6.76" and 6.14" x 5.85" and 5.10" x 4.86"
Each of the bath necessities from the medley above are also available for individual purchase. Feature them on their own, or in conjunction with the collage. 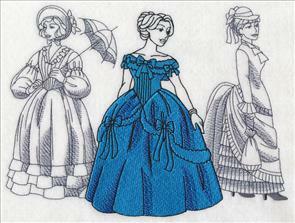 2.24" x 3.49" and 1.47" x 2.28"
2.61" x 2.52" and 1.71" x 1.65"
Celebrate the classic style of this era with fashion plates that show off traditional Victorian apparel. 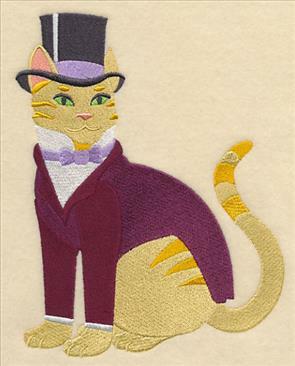 Versions featuring male and female fashions are stunning additions to quilts, sewing room decor, and pillows. 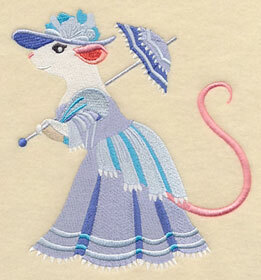 8.85" x 6.90" and 7.50" x 5.85" and 6.23" x 4.86"
Adorable animals in Victorian garb will charm their way onto your next embroidery project! 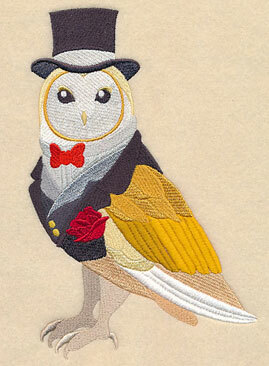 Top hats, elegant apparel, and more give each of these designs a distinct, traditional style. 5.85" x 7.47" and 4.84" x 6.18" and 3.02" x 3.86"
These four animals -- an owl, mouse, pug, and cat -- are the perfect addition to kids' gear, quilts, and more. 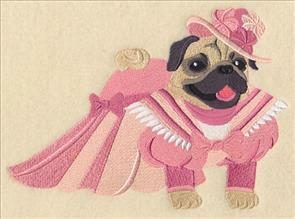 Stitch the chic kitty on a sweatshirt, or add the graceful pug to a blanket. 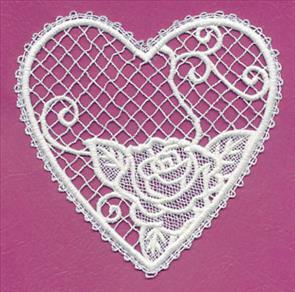 5.86" x 6.58" and 4.86" x 5.46" and 3.44" x 3.85"
Freestanding lace hearts get an extra level of taste and beauty with intricate roses stitched inside. 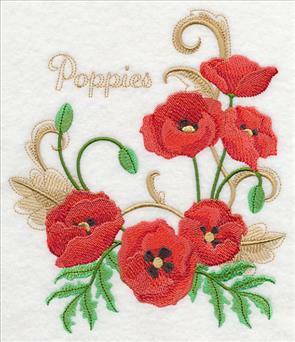 Slip one inside a card, hang in your window, or use as a decoration in your home. 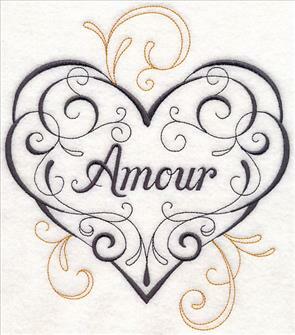 Find the instructions for embroidering these lace hearts here. 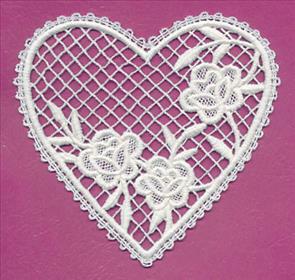 5.60" x 5.40" and 4.97" x 4.80" and 3.89" x 3.75"
Three different versions of these hearts with roses have been created in the classic Battenburg lace style -- stitch them all for your home! 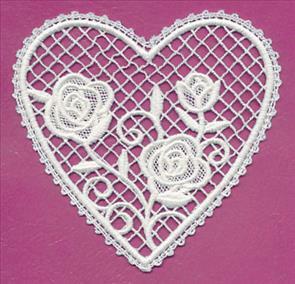 5.56" x 5.40" and 4.93" x 4.78" and 3.89" x 3.78"
The combination of lace roses atop the Battenburg lace heart is a beautiful pairing. 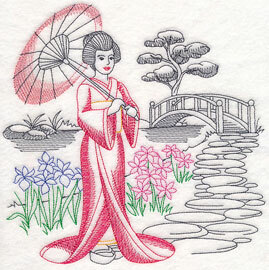 Helen sent in a design request for a sketch-style geisha standing with an open parasol above her head. 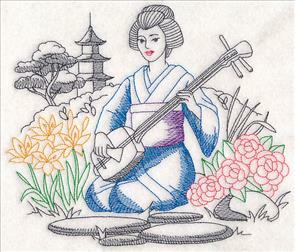 In addition to this stunning design, we also added a motif featuring a geisha strumming the traditional Japanese shamisen, a three-stringed lute. Great suggestion, Helen! 8.10" x 6.90" and 7.57" x 6.44"
6.88" x 5.86" and 5.71" x 4.86"